Situated not in ancient Egypt but in the leafy suburbs of Belfast Northern Ireland. A family run pub with something for everyone from Acoustic Rock sessions and Pub Quizes in our downstairs Bars to the cutting edge of heavy rock and tribute concerts in the purpose built music venue upstairs. Have you got Google Earth on your computer? If so, then download the Google Earth view of The Rosetta Bar. Is this the wrong position for The Rosetta Bar? If you think so, then modify its position. Click / Tap the button above to get directions from where you are to The Rosetta Bar. 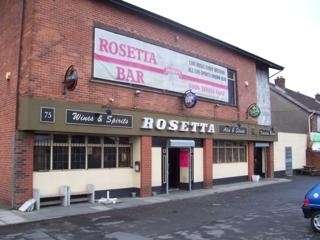 Had a family meal in the Rosetta today and would recommend it to everyone. Staff very friendly and service good. Good value for money and meal was lovely. Very satisfied customers. Anybody remember Ann Martin and Bobby Sinclair in the 70s/80's? I am shocked that my favourite pub has been taken over. I must say the last owners put on a great show and they are missed terribly. New people seem to be trying but the beer quality (particulary the Guinness) has gone downhill, the Rugby and the football coverage is not as good as before though one plus is that some of the staff are still with us. Also I was displeased to see a few persons that were banned back in the bar. I hope this isn't the trend for the future and given time the new owners will sort it out. My local, and a great bar. Am a bit concerned as it has just been bought over and is currently closed. Hopefully to repopen in the next weeks or two. Hopefully the new owner doesnt mess with the football shown, although there are rumours that its been bought by Keith Gillespie! Super place for a nice lunch, a pint of Guinness and watching the rugby. Staff are very attentive. Very well run bar. During rugby games you may even spot the odd local celeb. I was there when two internationals were in having a pint. Good atmosphere. The staff are wonderfull and so is the smoking area/beer garden. I really mean this, I have never met nicer staff in a pub. Gets very busy at the weekends now though. Friday nights are best for a relaxing bite to eat and a pint. One gripe is that they don't serve food long enough during the week. Even on a Sunday the food stops at six but it is very very good. Absolute gem of a pub that I have just recently came across. Have been going regulary now for grub and they sell my fav beer Becks on draft. Prices are very cheap for what you get. Gets a bit packed for the rugby and football though and as already stated you can't smoke in the downstairs bar but thats good as I don't smoke. Was in the Rosie just last week and I to used to work there when I was a student. Good to see the standards I set are just as high ;). Can't say a bad word about the place and its great to see some of the staff I worked with still there. Excellent food and the Rugby coverage is the best in Belfast. Just had my Xmas dinner at the Rosie. Craic was great and the food super. The no smoking part of the deal gets the thumbs up from me to. Also the Rosie is by far the best live music venue in Belfast PERIOD! unbelievable spot, recommend going down on a big liverpool match, some atmosphere on big football match days. Just had to put a note up about this place. The non smoking lounge is an excellent idea and the food really is top notch. I was there last night for the first time in 10 years and was well impressed. So much so i'm taking the missus there for lunch on Sunday. I shall report my findings. The Rosie is my local. I love it! and it's even better now that they have banned smoking in the new lounge. Other pubs should take head of how this place is run. I go to other places but always feel at home in the Rosie. I used to work as a waiter upstairs in the music lounge a few years ago. The music might have changed but the place is still the same great bar. I dont get the chance to go as often as I would like not living in Belfast any more but I can heartily recommend the bar especially for rugby fans. Went there to watch the Rugby as I read on this site it was a good place to go. Well it wasn't as I couldn't get in. The place was filled to the rafters. So I called in the next day to watch the football and I had an excellent lunch. I live nearby but usually hit the Ormeau RD but I have found a much better alternative. Very good bar for food and sport. This is my venue of choice for watching the Rugby. Tonight I watched Ulster slay the Dragons in a bar packed with rugby fans. Increadible atmosphere and very good food and drink at very reasonable prices. Must give a mention to the staff for their great pints of Guinness and putting up with us crazy Ulster fans. I like this pub. I go nearly every week because the football coverage is very good. They also do a great job of the Rugby especially the Celtic league and is usually rammed to the rafters when Ulster play away and at home due to Ravenhill being a couple of hundread yards down the street. Handy for parking the car if your going to a game. The food is great and very well priced but check the times. I went one Tuesday afternoon to find out they only serve into late evenings at the weekends. I had to go elsewhere. The place can at the weekends get invaded by heavy metal fans waiting to get in upstairs. Don't be put off by this as they go upstairs into the music lounge and are very well behaved they just sometimes "look" odd. Good doorstaff who keep a very low profile. Never had any trauma in the 2 years I've been going there.